Ever since I moved to Austin, in the early 1990’s, I noticed an unusual building south-west of the city. I was always curious about it as I passed it on the way to the famous Salt Lick BBQ restaurant in the hill country. Two weekends ago, I finally visited, during the big Diwali celebration. I have to admit that, other than occasionally eating Indian food, having some Indian co-workers and visiting the country once, I’m not very familiar with the Indian culture and customs. Diwali is the Hindu festival of lights, celebrated every year in Autumn (in the northern hemisphere). I took the opportunity to visit Radha Madhav Dham during this major celebration. I found out that Radha Madhav Dham is the oldest Hindu Temple complex in Texas and the largest in North America. It was originally called Barsna Dham. I got there just before sunset and before the major celebrations started. I used the opportunity to look around and capture some images. You can see the Hill Country Sunset, reflecting off the marble of the Shree Raseshwari Radha Rani Temple. 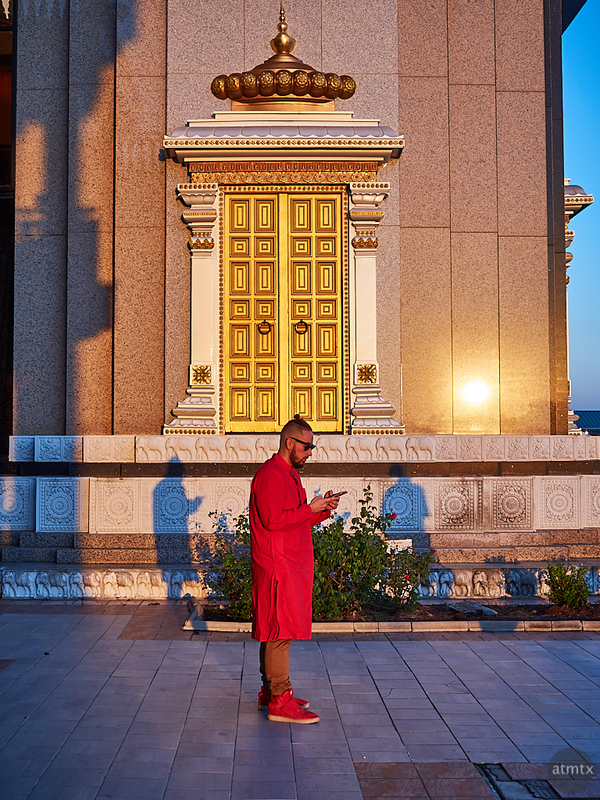 I thought this man in red, in front of the golden architecture, made for an exotic, un-Austin like image.